Edna (Mae) Erle Harper was born in Beaumont, California to Joseph and Edna Roberts on August 21st 1920. She was the youngest child of four, preceded by Harold, Doris and Katheryn, her siblings. Edna married Ralph Edgar Harper on April 13th 1941. She and Ralph moved to Jerome after retirement, where they built a house and discovered square dancing. They also enjoyed camping. Edna and Ralph eventually moved to Twin Falls where they remained. After 68 years of marriage, the love of Edna’s life, passed away in 2009. Edna continued on, living independently and even driving until her 98th birthday, enjoying the company of her children Bob Harper (Toni Harper), Susan Garces (James Garces) and grandchildren Kiley Blake (Jessi Mae Wilson), Chris Harper (Char Harper), Joseph Harper (Katie Harper) and Colter Henderson. 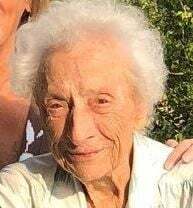 Edna passed away on January 13th, 2019 with her family by her side. Edna lived an exciting and memory-filled life. She made many friends and will be missed by all.